The Merseyside Bus Club came into existence in 1976 at a time when, amongst other things in the bus world, the final rear open platform buses were being withdrawn from service by bus companies in the United Kingdom. It was a time to organise ‘Farewell Tours’ using these buses and on Merseyside this was no exception! The first tour took place in Liverpool on 5th December 1976 using former Liverpool Corporation, now Merseyside PTE, L227 (SKB 224), a 1956 Leyland PD2/20 with Crossley/LCPT H58R bodywork. The second tour was on 20th March 1977, this time on the Wirral to mark the end of rear loading buses there, using former Birkenhead Corporation Transport, now MPTE 152 (GCM 152E), a 1967 Leyland PD2/37 with Massey H66R bodywork. 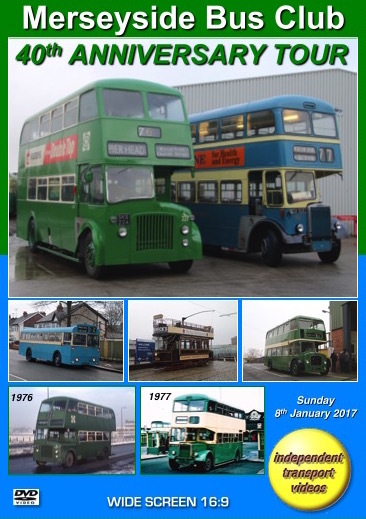 To commemorate these two events, and to mark the Club’s 40th anniversary, a tour was organised for the 8th January 2017 and the independent transport videos cameras were invited to record the event, especially as the cameraman was also in attendance on both previous tours! It is also amazing to think that both the vehicles used on those Farewell Tours still survive in preservation in 2017. The day begins very early at the Wirral Transport Museum in Taylor Street, Birkenhead, where four of the days’ vehicles are housed. We see former Crosville Motor Services DFG38 (319 PFM), a 1961 Bristol Lodekka FS6G with ECW H60RD bodywork, Birkenhead Corporation Transport 93 (RCM 493), a 1964 Leyland Leopard L1 with Massey B44D bodywork and Birkenhead 152 all leaving the ‘depot’ and being prepared for the day ahead. Our cameras board 93 and journey from the Museum via the docks and the Queensway Mersey Tunnel to Broadgreen in Liverpool for the first pick-up of the day. With the first group aboard we journey through the city and the Mersey Tunnel back to Birkenhead to join the Crosville Lodekka at Conway Street Station for a brief tour of Birkenhead. We arrive back at the Museum in Taylor Street where our next vehicle is waiting for us. This time it is Birkenhead Corporation Tramways No.20, a Milnes tramcar dating from 1900. Before setting off on our tram ride we pose 152 and DFG38 together to recreate a similar photograph taken on the 1977 tour when 152 met up with sister Lodekka DFG30 (311 PFM) that was on a Crosville Enthusiast Club Tour! We travel on tram 20 to Woodside to join 152 for the long ride to Ormskirk for a lunch break at the Toby Carvery. After an enjoyable ‘Sunday roast’ the group were greeted with a lovely surprise - the arrival of L227 (SKB 224). We then travel on L227 to the Merseyside Transport Trust’s (MTT) depot at Burscough where both vehicles and members were assembled for group photographs! From here we ride back to Ormskirk on L227 with 152 following. It is now time to return to Birkenhead onboard 152. With the light failing we drive through the streets of Liverpool, the Queensway Mersey Tunnel and Birkenhead, dropping off our passengers after a truly remarkable tour. Well done to all involved, especially to Bill Barlow for the last 40 years! Our programme concludes with a gallery of still photographs taken on both the original tours some 40 years ago featuring L227 and 152 alongside the contemporary vehicles of the day which are now long gone.